Y'all it's my favorite time of year, BBQ SEASON! Nothing gets my heart pumping like firing up the grill, lighting up the smoker, and creating some outdoor cooking goodness. Burgers, chicken, ribs, you name it, I love it all. The thing I don't love, however, is trying to come up with sides to bring to said BBQ's when invited. You know what I'm talking about, the sign-up list goes around for the church picnic and you instantly go into panic mode because WHAT ON EARTH CAN I POSSIBLY BRING THAT CAN COMPETE WITH SALLY MAY'S FUNERAL POTATOES!?! And if that's not you WHO ARE YOU and WHAT'S YOUR RECIPE because I need it in my life! All kidding aside, this time I'm going into the BBQ season with a game plan and that game plan is my Mexican Pasta Salad with Tortellini! 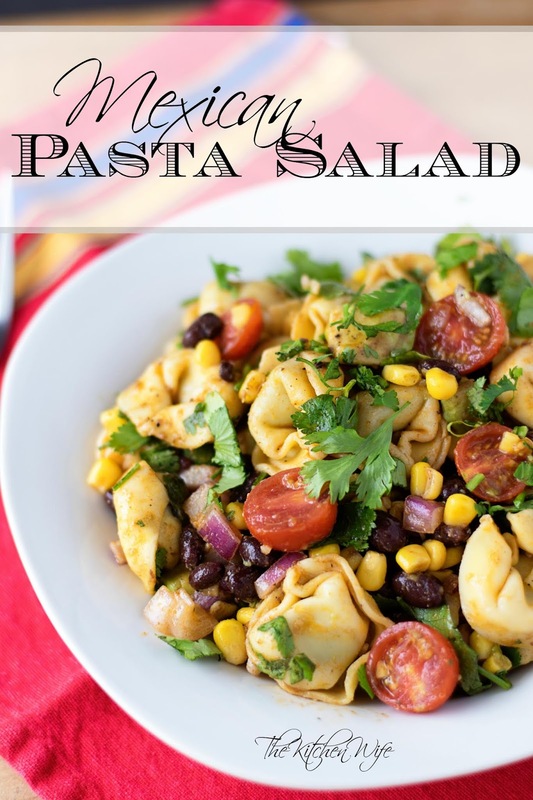 For this Mexican Pasta Salad Recipe with Tortellini you'll need a few simple ingredients, most of which you may already have on hand! To get things started you'll need to prepare your tortellini according to the directions on the package. Place the cooked tortellini into a large mixing bowl. Next you'll add the black beans and corn. After that add the diced onion and cherry tomatoes. Finally you'll add the avocado. Now, every good salad has a great dressing and this one is NO different! Now pour the dressing over all of the Mexican Pasta Salad ingredients. Toss everything together so that everything is coated in that lovely dressing. The next step is to add a little freshness so I chopped up a little cilantro. Add it to the bowl, give everything another quick toss, cover, and chill in the refrigerator for 2 hours. And there you have it, my delicious Mexican Pasta Salad Recipe with Tortellini! All these zesty Mexican spices are sure to breath new life into your pasta salad game and have people saying "Sally May's funeral potatoes WHO!?!" It's the perfect BBQ side, meatless Monday meal, or add a little chicken and a meal all on it's own! I know you're gonna love it so get in the kitchen and make it TONIGHT! Prepare the tortellini according to directions on the package. 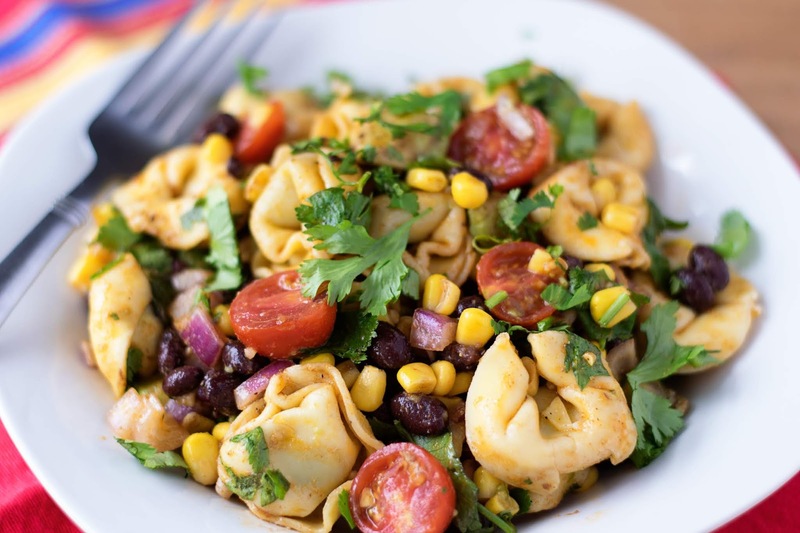 In a large mixing bowl combine the tortellini, beans, corn, onion, tomatoes, cilantro, and avocado. Toss it all together. In a smaller mixing bowl whisk together the olive oil, rice wine vinegar, lime juice, taco seasoning, sugar, garlic, salt, and pepper. Drizzle over the pasta salad. Toss everything together so it is coated in the dressing and chill in the refrigerator for 2 hours.